Our organization is engaged in providing a qualitative range of Statue Shirdi Sai Baba Ji to our clients. These are made using best grade marble, sourced from certified vendors in the market. This statue is completely white and acknowledged for the light weight and quality. Furthermore, we offer our range at competitive prices. Shirdi sai baba is an widely acknowledged saint having followers all over the world. 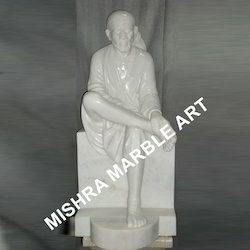 We offer a wide variety of Shirdi Sai Baba In Marble in most life like representation. 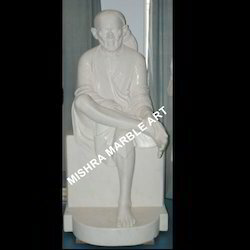 Sculpted out of pristine white marble that we source from highly dependent vendors this statue is noted for attention to details like the smile on baba's face the particular way he puts one leg above another and the drape of his attire brings the marble statue to life. Our rates are most affordable so that more devotees can avail of these life enhancing statues. 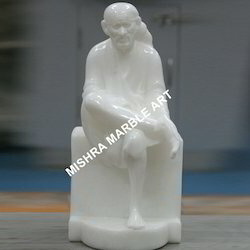 Being a client centric organization, we are offering a comprehensive range of Marble Shirdi Sai Baba Ji to our clients. In this statue, Sai baba is in siting position. Our range is ideal for gift purpose and acknowledged for the smooth finish. These status find huge demand in the market fro the smooth finishing and quality. 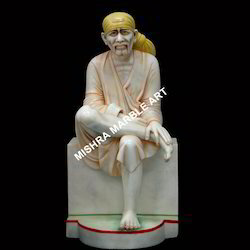 Owing to the support of our experts, we offer a wide range of Shirdi Sai Baba Ji In Marble to our clients. This statue is pristine white and has a seamless molded finish. Further this statue shows Sai Baba sitting on a rock with legs crossed. We also offer this statue in various sizes, which can be customized as per the requirement of our clients. 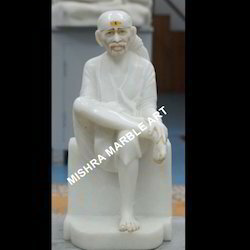 We offer a wide range of Shirdi Sai Baba In Marble to our clients. Looking for Shirdi Sai Baba ?